Drawing and stitching are mark-making methods that continually appeal to me because of their immediacy and ability to convey emotion. There is a strong associative element in fabric that intrigues me. 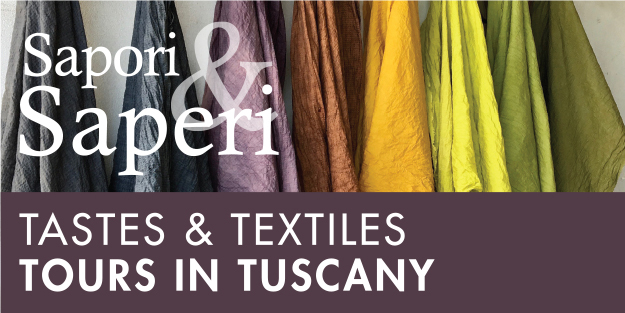 I like to gather fabrics and ideas together and begin to experiment, usually working with linen but I have recently been excited to play with burlap because of its raw quality and transparency. 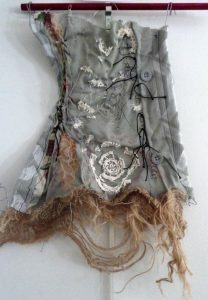 My work is mostly autobiographical- inspired by stories, nature, emotions and textile materials. My subjects frequently have a narrative element and tell stories from my everyday life, nature or political issues through a variety of materials and textures. 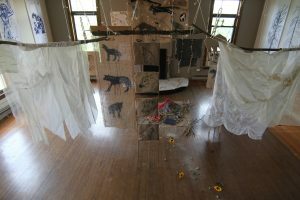 I have recently been designing pieces to come together as a large textile installation- Wolves, Brides and Fairytales. This installation is reminiscent of a walk in the forest of a fairytale. Following a path of stones and fallen sunflowers, one encounters images of wolves- mythic and real- on cardboard, felt, burlap and video. 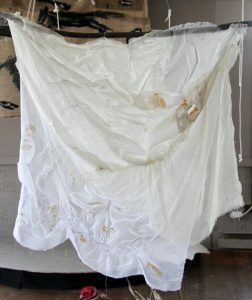 There are also embroidered chiffon textiles, suggestive of brides, princesses, and other symbolic objects, often employed in fairytales to represent magic and disguise. I am interested in the archetypes represented in the old tales and their psychological and feminist underpinnings as explored by Clarissa Pinkola Estes in her book, “Women Who Run with the Wolves”. For example, in the story of “Blackbeard and his Wives,” women who forfeit the use of their intuition suffer consequences. This is presented in contrast to Mother Wolf who teaches her pups all about the dangers in the wild. For me, art making is best when it is an adventure into new ideas and new combinations of materials, and I hope my viewers share that experience. 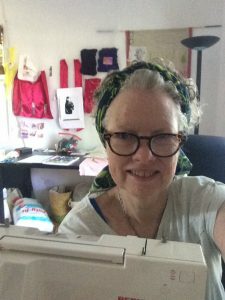 Mary McFerran is an artist based out of Croton-on-Hudson, NY and has been an SDA member for 1 year. She received her MA in Printmaking at University at Albany and her MFA in Expanded Arts at Ohio State University. She has also studied Textile Art and Surface Design in London, England. 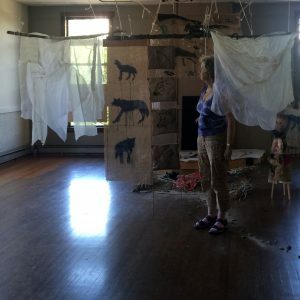 Mary recently exhibited her textile installation Wolves, Brides and Fairytales in the Ossining Arts Council Steamer Firehouse Gallery in Ossining, NY this past July.